By 1997, I was well-and-truly entrenched in the work of Robert Smithson. This process had begun with my dissertation research; hence the ‘what did he know and when did he know it’ tone below. And it extended into a 1997 road trip to numerous earthworks sites in the American Southwest. 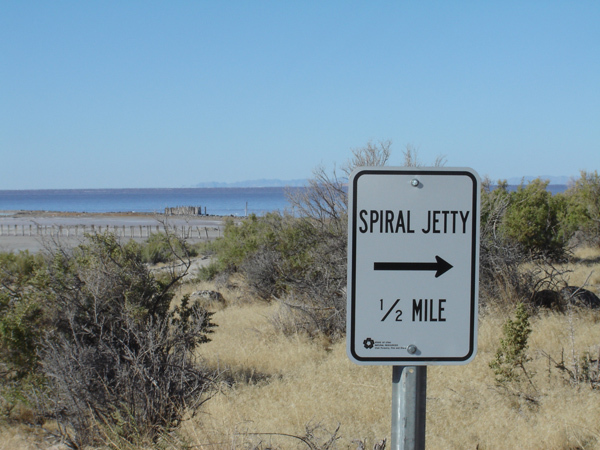 (The ‘Spiral Jetty’ was under water at that time and I didn’t get to see and walk it until 2006.) An invitation to speak on Smithson at Melbourne’s Centre for Contemporary Photography became an opportunity to reflect on the fine line between research and fetishism. Renowned as an earthworks and installation artist, Robert Smithson has more recently been identified as a photographer.1 Once a supplement to his practice as a writer, or an ambivalent symptom of art market’s appropriation of post-studio documentary material, Smithson’s photographs have now been deemed central to his oeuvre. With this new attention comes a curious side effect. Smithson has been identified as the subject of photography, as well as a producer of photographs; photographs of him have attracted as much critical attention as the photographs he made. To a certain extent this effect could have been anticipated. In the early 1970s, Smithson was a prominent figure in an art scene increasingly conscious of the marketability of the artist’s image.2 His early death amplified the cult of personality, with photographs of the artist becoming a talismanic surrogate for him. But the passage from image to imaginary is still surprising, if only for what it reveals of art historical desire. The attention brought to bear on images of Smithson is of a psychic, not merely scholarly, order. This goes beyond the competitive and proprietal impulse to research, so aptly charted by A.S.Byatt in her novel Possession. To discuss a photograph of Smithson’s ‘Spiral Jetty’ (1970) is to articulate a desire to be there. To discuss an image of Smithson is to articulate a desire to be there with him, even to be him. These are the forms fantasy and surrogacy that appear on discovering that, when I discuss others’ desire for Smithson, I unearth my own. Whether documenting his work or illustrating his essays, Smithson’s photographs were often blunt, artless, and amateurish. His preferred camera was a Kodak Instamatic 400. For decades, Kodak had suggested that ‘you press the shutter and we’ll do the rest’, and who was Smithson to argue? His photography was of a piece with conceptual art’s disdain for art photography; an attitude epitomized by John Baldessari’s assertion that the worst event in the history of the camera was the invention of the viewfinder. Smithson took conceptual art’s insistence upon the mute mechanism of the camera a step further, reflecting not only on the reproducibility of the image but also on the proliferation of the camera itself. It is this curiosity about the status of the camera as both an apparatus and commodity that has made Smithson so appealing to recent criticism, intent as it is on establishing photography as the foundational figure of postmodernity. The passage is typically Smithsonian, inviting the reader to tease out the densely layered motifs, literary sources and discursive allusions that are a hallmark of his writing. Linking the words ‘abominable’ and ‘power’ equates abjection and authority in a manner redolent of the Vietnam War era. The word ‘wilderness’ is shot through with intertextual resonances; the Bible, the western movie, the sublime landscape and Ballard’s post-apocalyptic sci-fi. The Ginsbergian tenor of the phrase ‘I have seen …’ recalls Smithson’s early flirtation with Beat culture. The motif of the invention of multiple worlds evokes Jorge Luis Borges’s short story, ‘Tlön, Uqbar, Orbus Tertius’, one of several key Borgesian sources to his work. Robert Smithson. ‘Spiral jetty’, 1970. Submerged edge of the jetty. Photograph: Chris McAuliffe, September 2006. This is the sort of hand wringing in which someone like myself, who has one foot in the camp of art criticism and the other in art history, is bound to indulge. But since Smithson has become something of a poster boy for American postmodernism, the question of his relationship to photography segues into that of the privileged status of photography within theories of postmodernity. The question might then become; how might we use the position of photography within Smithson to distinguish between a genealogy of postmodernism and theories of postmodernism. That is, can photography lead us to a historical rather than figural version of postmodernism. I don’t mean the distinction to be as bald as it might first appear. I have in mind Paul de Man’s suggestion that criticism is of necessity reliant on figural language; that it is primarily constructed out of rhetorical figures such as metaphor.6 Historical explanation, as a form of writing, is also reliant on figural language, and yet my position is fundamentally that where criticism may say ‘photography is like …’, history may say ‘photography is like this because …’. It is not the simple invocation of causation that makes the difference; I mean it as a shorthand way of pointing to history writing’s search for a more material anchorage for its own discursive play. There is no question that many of Smithson’s ideas bear a strong family resemblance to those later named postmodern. And there is clear evidence that he read several of the authors regarded as key postmodern theorists.7 But while the cult of Smithson, which arose after the publication of his Collected writings in 1979, established powerful and convincing postmodernist readings of his work, it was remarkably limited in its analytical and rhetorical range. This has important ramifications both for the interpretation of Smithson’s photography, and for the status of photography within postmodernism. All these rhetorical figures—transgression, traversal, boundary hopping—are familiar components in a 1980s and 90s postmodern vocabulary. They are plausible, within that context, but have a self-propelling momentum that leaves the image behind. Prinz is so smitten with the metaphor that a number of relatively obvious possibilities are overlooked. First, Morris is in the photograph as well (leading Smithson), yet he is rhetorically absent, somehow less transgressive than Smithson. Second, since the ‘No Trespassing’ sign is visible, on ‘our’ (the viewers’) side of the fence, Holt’s photograph shows the two artists leaving, rather than entering, the quarry. A minor point but one that reverses the narrative; the artists are returning to the permitted zone, rather than abandoning it. Third, and most important, the photograph is a self-consciously staged image. It was produced not as mere documentation but in order to be inscribed within a narrative of vanguardist transgression. Further, it was manipulated in order to emphasise the presence of Smithson over Morris: a section of the photograph is enlarged, blown up and montaged to the original print, amplifying the figure of Smithson. If the image is to be read as evidence of Smithson’s transgressive vanguardism, it must also be read as an image deliberately generating such a status, not simply mutely recording it. Yet, for all the postmodernist rhetoric, Prinz seems happy to accept the photograph as a kind of empirical evidence, even as she gives it the rhetorical treatment. It is this reversibility in postmodernist takes on photography that interests me; this tendency to posit photography as the figure of postmodernity, even as certain modernist readings of it (particularly its realism) are maintained. Photography featured prominently in the writings of several key theorists of American postmodernism, usually being identified as the bad conscience of modernism. For critics like Douglas Crimp, Craig Owens, Hal Foster, and Rosalind Krauss, photography was the always already present flaw in the modernist glass. If postmodernism were to be defined as a series of inversions and reversals of modernist ambitions, photography served them up in spades; mechanization against craft, multiplication against singularity, reproduction against originality. The curious thing about the place of photography in such models is that it demands that photography be both synchronous with modernism (always already there) and posterior to it (coming into its own in the 1980s, usurping modernism and signaling its demise). I would like to suggest a Smithsonian device that might make this double game more apparent, and less of a fudge; the figure I have in mind is the dialectic of site and non-site. Smithson’s Non-site, Franklin, New Jersey (1968) paired an aerial photo-map of the actual site with trapezoidal wooden boxes containing rocks collected there but displaced into the art gallery. Smithson’s dialectic linked such terms as open/closed, outer/inner, subtraction/addition, edge/centre, indeterminate/determinate.9 His opposition between the anterior landscape source and its posterior traces or representations in the art gallery, preserved both sides of such oppositions without privileging either or resolving their conflict; ‘it says “yes” and “no” at the same time’.10 It is opposition as differend—on ongoing dispute—rather than as aufhebung—the supercession and repression of one term by another. When photography is given a prominent, but strictly demarcated, position within postmodernism (as the thing that proves modernism wrong and symptomizes that which supplants it) we have a postmodernism defined in linear, reactive, even modernist, terms. Such narratives set up their own sets of opposition—singular/multiple, original/reproduction, real/simulated—privileging the latter term in each case. The site/non site opposition, on the other hand, shows a way to preserve difference as liminal struggle, perspectivist mobility, and deferral of resolution. It positions photography dialectically, rather than constructing a simple narrative of stylistic or epochal succession. The model of photography as the bad conscience of modernism is useful, because it traces this struggle. What needs to be done away with is the more instrumental notion of photography breaking with modernism and naming its end. This is particularly important given the recent tendency, following Martin Jay,11 to map the postmodern as the anti-visual. Smithson and many of his peers had highly complex notions of anti-visual practice, often intimately related to photography, but certainly not ones reducible to models of reversal and overthrow. Working through Smithson’s positions on photography, I may eventually arrive at the sorts of positions constructed by postmodernist criticism; Smithson did use photography to destabilize the autonomy and integrity of the modernist art work. But such an argument ought to be constructed out of the historical conditions of Smithson’s practice, rather than a retroactive critical occupation of it. Following Smithson’s metaphor of site and non-site, it is necessary to both identify and preserve two opposing positions; history’s relative autonomy from criticism, and criticism’s desire to colonize history. Signage, Rozel Point, Great Salt Lake. Photograph: Chris McAuliffe, September 2006. What Krauss pointed to was the entry of art into a post-industrial, information economy. And whatever the critical capital that might be reaped here, that passage can be given a history: a history that would speak of a growing arts audience; an increasing professionalization amongst art critics and publishers; a growing recognition that the means of production lay beyond the studio, in the media. Such a history would develop a model of postmodernism out of a photographic economy, rather than staging photography as a figural elimination of such modernist tropes as authorship and originality. The difference between the two rests on a significant difference in the reading of photographic reproduction. Smithson is more interested in a photographic economy; the mass marketing of cameras, the traffic in all manner of photographic images (cinematic, scientific, touristic, domestic). Krauss, while hinting at this, turned later to a figural reading of photographic reproduction, using Sherrie Levine’s re-photography to declare the end of modernism. 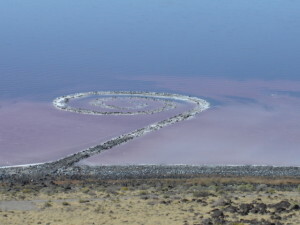 Smithson’s own orchestration of the image of the Spiral jetty suggests a determination to exploit the dialectical possibilities of the media-disseminated photograph. 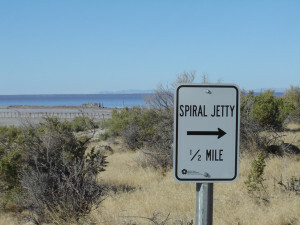 In his film of the jetty, Smithson counteracted the singularity of the printed image of the Spiral jetty by mobilizing and multiplying it; the jetty swirls through cartographic, textual, astronomical, documentary, mythological, and psychedelic discourses.13 All the same, he had provided the still photographer with detailed written and diagrammatic instructions for the photographing of the jetty.14 Again, the dialectic of site and non-site seems the most appropriate frame here, as Smithson played on both the openness and closure of the photographic image, maintaining the struggle between the real and the represented, the frozen and the mobile, the authorial and the delegated, the actual and the staged appearance. What is enticing about Smithson’s photography is his willingness to both fully exploit and confound it; once more, the dialectic of site/non-site, or more specifically, sight/non-sight. Krauss was right, the work had to circulate as an image; but Smithson made life difficult for the photographer. If it wasn’t the sheer scale of his work that confounded the photographer, it was all those mirrors, constantly challenging the notion that empirical documentation should not reveal the conditions of its own construction. Leafing through the catalogue raisonné of Smithson’s work, I’m constantly struck by the tripods, hooded photographers and lenses that indiscreetly intrude. No neutral empiricism here, no parthenogenic images; instead a proliferating and fragmented series of images of photography itself embedded in the surface of mirrored sculptures, allowing Smithson to capitalize on both photography’s authority (its putative realist ontology) and its insecurity (the technical and discursive constructedness of that ontology). Here Smithson pointed to a further significant issue for photography, the relationship of image and text. If the ontology of the photograph lies not so much in its putative realism as in its circulation, it is the coupling of text with the image that directs its reading and, crucially, subordinates it to word.19 The claims for the radical empiricism of photography are then questionable, to say the least. For Smithson, photography was a medium inseparable from text, and from the staging of the relationship of text and image on the printed page. Photography was an inclusive term for him; referring not just to the print but to print technologies such as the bromide, the blue print, and the Xerox. Again, postmodern criticism has yet to come to grips with the historical proliferation of photographic processes, preferring to dwell on the proliferation of images as a metaphor for the waning of modernism. Once more, the temptation is to read this discursive hybridity as some kind of post-modern, post-rationalist, post-Enlightenment collapse of the grand narratives. I am not suggesting that such a reading is inappropriate. There are many occasions where Smithson made a direct connection between photography and such rationalist procedures as cartography (and like many before him, associated photography with mobility, omniscience, and virtual geographies). There are equally as many occasions when Smithson used photography to baldly pit systems of knowledge and visual genres against each other; industry and entertainment, fact and fantasy, ego and id. But if modernist discourses implode in Smithson’s work, let’s not forget that photography’s authority collapses along with them. Unless of course you reinstate its authority by designating it the very harbinger of that collapse rather than as a rhetorical figure alluding to the collapse. It is here that I find Smithson’s take on photography useful; the difference between his inclusion of photography in the collapse and the more common tendency to see photography as a kind of catalyst (present in the reaction but not consumed by it) is salutatory. There is a tendency, I think, to narrow Smithson’s relationship with photography to one conforming with postmodernism’s more recent constitution of photography as the bad conscience of modernism. In such a reading, photography is a medium which, while redolent of the visual, can collapse the visual field into abysses, silence, and disinformation. That is, Smithson’s use of the mirror as an analogy for representation—a surface that captures image and time in entropic stasis—is cut adrift from its historical roots in the literature of Robbe-Grillet to become an instance of Derridean mis en abime. When shards of slate reappeared boxed in an art gallery, as Non-site (1968), the work spoke of the absence of the site, an invisibility that the photograph could only inadequately compensate for. If this amounted to an anti-visual sentiment—the paucity of representation as compared to the intensity of the absent site—Smithson was not privileging the truth of the absent site. The gallery non-site staged the inadequacies of physical containment (the box inside the box of the gallery) and Cartesian visuality (the perspectival carpentry of the box), but there was equally little evidence of the actual site (other than a single photograph, shot by Smithson’s dealer, and the artist’s own, second-hand, description). The difference between the two is a non-hierarchical one; the difference is to be maintained, not resolved in the privileging of one term of the dialectic over the other. It is the non-site’s ‘yes’ and ‘no’ that strikes me as important. Early definitions of the postmodern, and many still, are built on binary opposition and closure (the end of modernism, the end of the grand narratives). Photography frequently appears as symptomatic of many of these ends (of authorship, of originality, of aura) … or better, an end that was there at the beginning, as if modernism was one big detour. What the site/non-site dialectic offers is a way of registering difference more fluidly, in a way less hamstrung by the linearity of art historical narrative (a linearity that art history hasn’t been able to throw off, regardless of its conversion to postmodernity). And what of Smithson’s own appearance in photography? The documentary tendency in itself meant that many photographs of Smithson on site—wading, fossicking, shovelling, measuring, and of course, photographing—exist. Smithson’s tragic death has given these more of a fetish quality than they might normally have. Smithson seems to have accepted his presence in photography as part of the job of being an artist, as if, like his works, he would only exist if reproduced. Typically he moved very quickly from the standard brooding-artist-with-work shot to the more playful photography like the videotape East Coast, West Coast in which he and Nancy Holt acted out the roles of New York and Californian artists (again the differend), with Holt as the hard-nosed careerist and Smithson as the spacey hippie arguing that ‘definitions are for uptight people’. But there is more to this than reinforcing Smithson’s tendency to fold photography (as a structure, not just a medium) back on itself. I, too, am appropriating him, claiming to appropriate him for truth, against its perversion. My relationship with the image of Smithson, has another aspect to it; one that allows me, at least for myself, to maintain a certain vigilance regarding the relationship of art history and its objects. Some years ago a student suggested somewhat breathlessly to me that I looked like Smithson; as if there were a certain spooky propinquity to the likeness. I checked, and, already succumbing to fantasy, thought she might be right. I asked around and there seemed to be some consensus. I presented a photograph of Smithson to an innocent eye, my daughter, who was pleasantly surprised to find a picture of her daddy in a book. But the coincidence (one reinforced by the putative truth of the photograph incidentally; it wouldn’t have come up if it were a matter of paintings, no one ever told me I looked like the Smithson in Alice Neel’s 1962 portrait) has some curious implications. First, my investigation of the likeness—my desire for it to be true—suggests something about my relationship as an historian with the object of my study. It would appear to be a narcissistic one; I wish to find in my object of study, myself … or at least the affirmation of my status (as historian, as bearer of knowledge). My will to know Smithson is propelled by desire, as if in Smithson I will find my Imaginary (my self conception as intellectual, as scholar) … as if my complaints regarding the cult of Smithson mask a desire to establish my own cult. If that is the case, then my claims to establish the truth of Smithson, and of the status of photography, collapse into what may be the perfect figure of art history, the narcissistic desire to establish the truth of one’s own ego. Having become conscious of my desire to be Smithson, or at least be like him, I began toying with what seemed to be the two logical outcomes; to amplify the fantasy, or to sublimate into my professional identity. In July 1997, I attempted to re-enact Smithson’s tour of Passaic. Armed with a map, and a copy of the same novel that Smithson had carried (Brian Aldiss’s Earthworks), I boarded a bus at the Port Authority Terminal. I disembarked at the iron bridge across the Passaic at which Smithson began his documentation of the tour. Painstakingly, I made my way towards his final destination, a diner in Passaic. Along the way, I discovered none of the monuments in his account. His terrain had been overtaken by new suburban housing, parks, and roads. The diner was now a McDonald’s. I had nothing to show for the trip but sunburn and a few cursorily shot slides. And yet I could not restrict myself to saying, as Smithson did, merely that ‘I was there’. If I had failed to see Smithson’s work, or to be Smithson himself, I could still succeed in being an art historical researcher. 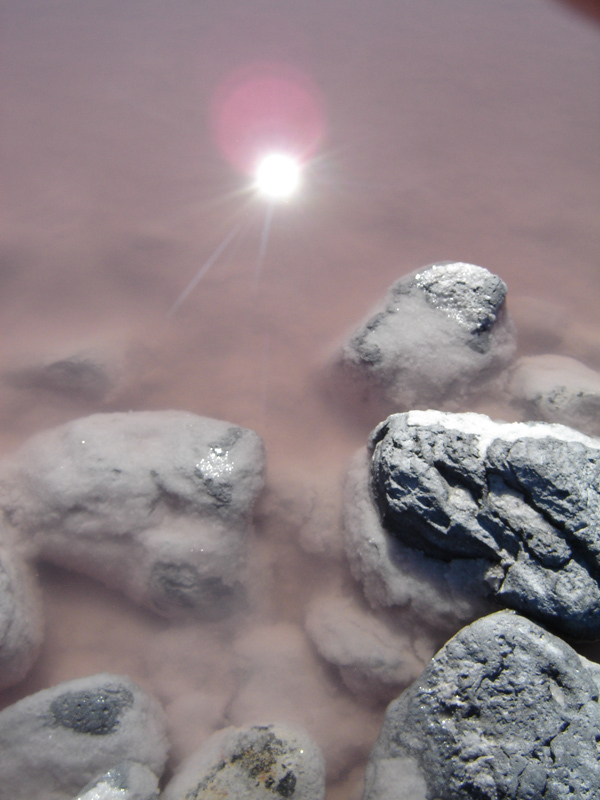 My aborted re-enactment was still acceptable as a component of my research itinerary, as was my aborted visit to the Spiral jetty (submerged in August 1997, I felt its rock with my toes as I waded in the opaque water of the Great Salt Lake). 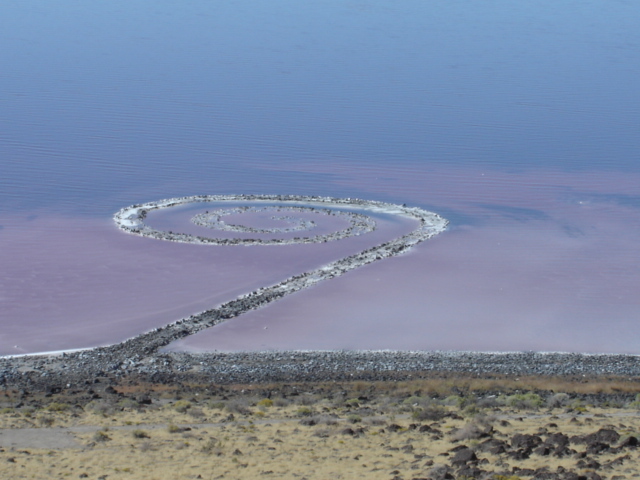 Just as Smithson’s absence ensured my presence as his epigone, so the non-sighting of the Spiral jetty would establish my credentials as an art historical researcher, in accounts such as the one you are reading. And there lies my fantasy, and its sublimation, in the meeting of the non-site of history and the site of art historical practice.